To speak of how Keaolani came to be a band, we must first go back in time to an era in Waikiki when Hawaiian music was at its "hey day" (circa 1950's). A young Hawaiian man, Kahauanu Lake, had returned from being musically schooled on the mainland, and began to apply sophisticated chordal and vocal harmonic arrangements to traditional Hawaiian material. He quickly rose to fame as he played at both the renowned Royal Hawaiian and Halekulani Hotels with his trio, and eventually recorded hit after hit landing himself his well-deserved induction into the Hawaiian Music Hall Of Fame. Also during the height of his career, "Uncle K." earned the adoration and devotion of a 15 year old boy who became Kahauanu's life long mentee. That boy, Walter Kamuala‘i Kawai‘ae‘a, eventually went on to become the leader of Kulia I Ka Nu‘u, and the Kahauanu Lake Singers, two music groups that continued to promote the famous "K. Lake style". Now, fast forward to 2002 when Maui kumu hula Gordean Lee Bailey, and long-time family friend of Mr. Lake, invited him and Walter to come to her hula halau on the slopes of Haleakala to teach her students how to play the ukulele, and then fast forward again to current day, where Walter Kawaiʻaeʻa has half a dozen classes on Maui and more in Honolulu, all instructing avid students in the art of the ukulele and the K. Lake style of chordal and vocal arrangements. Original class of Na Pua O Leilehua with our teachers, Walter, Kahauanu and Gordean. The original Maui class, formally called Na Pua O Leilehua, is made up of 11 very dedicated students, most of whom have been with Walter since he first came to Maui with Uncle K. in 2002. 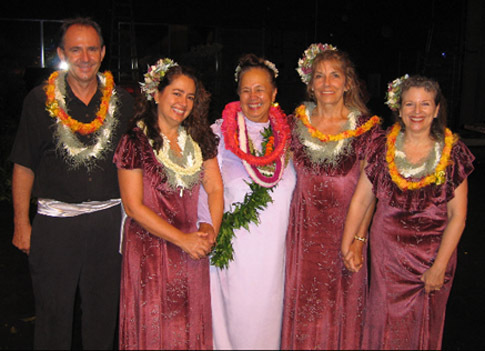 Although the entire class performed WITH Kahauanu Lake at the Castle Theater on Maui in 2004, not all of the class had time or inclination to want "performance" as the class focus, but a handful of the class did, and to honor that, Walter created a "by invitation" Performance Class in the Summer of 2006. By the Fall of that year, the class consisted of 5 members and the focus was on vocal arrangements in the K. Lake style. 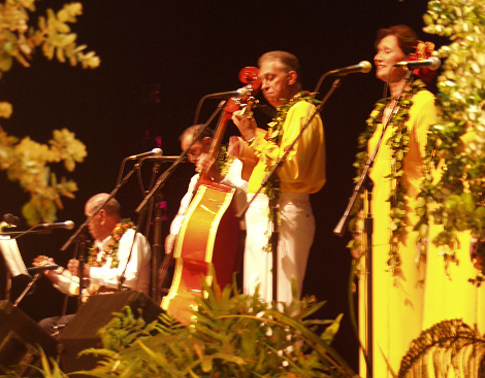 By the holiday season of that year, the Performance Class was making public appearances, accompanying Gordean Lee Bailey's halau, playing private parties and local fairs and festivals. Without even thinking about, the class was organically becoming "a band". Much at the same time, Kahauanu Lake officially "passed the baton" to Walter, making him his "son" and official torch bearer of the K. Lake musical legacy, so it was more than fitting that Walter have a mentee of his own, and the "class band" was clearly that. But, they didn't have a name. In January of 2007, Kahauanu Lake was invited to be the honored guest on the Pokipala show - a monthly live broadcast on KNUI radio from "under the monkey pod tree" in Wailuku, Maui, and rather than play his own music, Uncle K. requested that both Walter and the "Na Pua class band" be his musical representatives. This event was probably the instigating factor in Walter having a dream which brought forth our band's name. In an email letter to the bandmates, Walter wrote: And thus, in the middle of January, 2007, Keaolani was truly born. "...about a week and half ago I got up in the middle of the night and it came right out of mouth; Keaolani, thatʻs it, I said, I knew that was the name, I had such a warm feeling in my heart, the good kind warm feeling. I started to cry, because I knew that this was meant to be something special, I mean the work that weʻre doing together is very important, and to get a dream name, Hawaiians call it Po Inoa, is very unusual, and knowing that, is what makes this even more meaningful. I wanted to share all of this with you so you will always treasure this time and moment. Names are the most valued and treasured things that a Hawaiian could and can have, thatʻs why all of children have only Hawaiian names and they understand. I spoke with Papa K this morning; he is thrilled to give all of you that name. Here is the correct story behind it, first of all Kahauanu was given to him by Kaheiheimalie, his grandmother on his motherʻs side. Keaolani was given to him by his grandfather Lake, which was his grandfatherʻs Hawaiian name. the meaning "Heavenly Dawn", according to Uncle K means the dawning of a new day is how the Hawaiians expressed the beginning of a new birth or life and that it is directed from heaven. So, it fits as a name for your musical group that will carry on the K-Lake traditions via Kamualaʻi. You are the "Heavenly Dawn"; you are the beginning of a new life on the mountain at Haleakala, that those special musical sounds will be heard forever. I can not think of a more appropriate time and place to say "hello" to Maui than the broadcast on this Thursday! I asked Uncle if I could talk and introduce all of you, and your group and share the story behind your name, and then, I asked him to make it official to the world, by giving it to you along with his blessings and thoughts for success to all those gathered there as well all those that will be listening on the radio. I am very happy for all of you. I will give you and share with you every thing that he has given me." And thus, in the middle of January, 2007, Keaolani was truly born. In the Spring of 2007, one of our original 5 members needed to take leave of the band due to work and health related responsibilities, and now we are four. 1. Band leader, Pamela Melenani Polland is a seasoned professional with a coveted gold record and an ASCAP award to her credit. She has both performed and recorded with such luminaries as Bonnie Raitt, Kenny Loggins, Joe Cocker, Jackson Browne and many others, as well as her mentor Uncle "K." Pamela teaches voice as her "day job". See more details of her illustrious career at PamelaPolland.com. 2. Sugandha ʻOlapakauila Black began dancing hula and studying Hawaiiana in 1974 with Aunty Edith Kanaka`ole and her daughters Pua and Nalani of Halau O Kekuhi, and has been dancing and performing extensively with Wehiwehi O Leilehua since 1994. Sugandha is also an accomplished hair stylist and multi-talented craftsperson. 3. Suzette Laha'ole Marlowe has been refining her beautiful contralto voice in choirs, including the renowned Gospel Truth Choir, since she was a toddler. She has been studying hula, Hawaiian history, culture, language and music for a decade and also dances with Wehiwehi O Leilehua. Suzette is both an architectural and landscape designer alongside her many Hawaiian craft skills. 4. 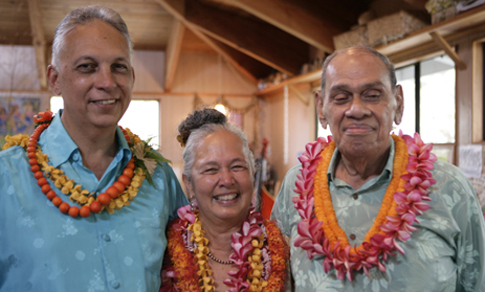 Dan Ka'ili Kai o Kaimana "Kohola" Sythe, renowned for his international work with cetaceans, and founder of The Whalesong Project, was an original member of Na Pua O Leilehua, as well as a student of renowned kumu hula Nona Beamer, Luana Kawa'a and others.. But when Walter invited him to join the "performance class" in 2006, he asked Dan to learn to play acoustic bass, since that was a needed element in the group. Dan also plays ukulele and slack key (Ki hoʻalu) guitar. 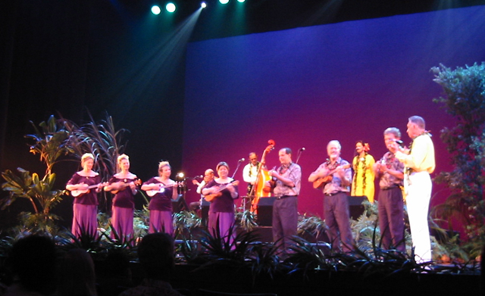 *All members of Keaolani are dedicated students of Hawaiian culture and language as well as the music of the islands.